… arriving at work early that morning. Shortly after I arrived, a co-worker had received a phone call and became quite animated on the phone. After hanging up the phone she announcing to us that she was just talking to her husband who worked across the river in NJ, and he advised her that a plane had just crashed into the World Trade Center (WTC). … immediately switching on the TV tuner on my pc to tune into the news. At the time, everybody thought it was just an accident. …calling my dad, who worked in Brooklyn, at 9:00. I told him that a plane had crashed into the WTC. … when I realized that this was no accident. As I continued to talk to my dad, I saw a second plane slam into the WTC. Shocked, I sadly realized that this was no accident. We were under attack. … calling my mother and my siblings to see if they were safe. Luckily they were. … thinking about my cousin who worked in the Duane Reade pharmacy located in the lower level of the WTC. He made it out safely and later told us that when the first plane hit, he was in the stock room. He heard a thud, but didn’t think anything of it because working in the lower level, he would hear all kinds of noises coming from the path train station that was directly underneath them. He stated that when he finally came out of the stock room, the store was empty. There were no customers in the store, and he didn’t see any of his co-workers. As he made his way to the front of the store, a police officer happened to be walking spotted him and shouted for him to get out of the building. … seeing the awful images of people leaping to their deaths to escape the flames. … seeing the towers collapse in just a few seconds. … thinking about the conference I was scheduled to attend at the Windows of the World Restaurant, which was located on the 101st floor the WTC, just a few days later on September 13th and realizing how lucky I was. … going down to ground zero the following week with a few co-workers to see the destruction with my own eyes. I remember that as soon as we exited the subway, we were hit with an awful stench. I remember my co-worker asking a police officer what the smell was and I remember his face as he just looked at her and didn’t say a word. At that point we realized what it was. It was the smell of death. …being overcome by a feeling of sadness. 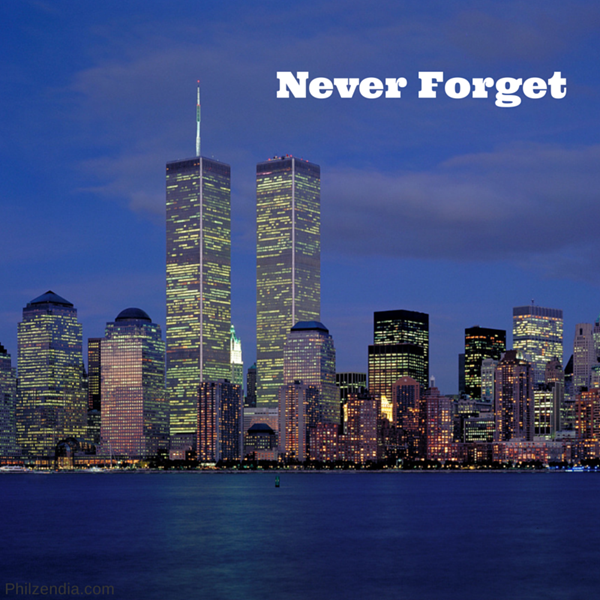 September 11, 2001 is a day I will never forget. Please take a few minutes out of your day to remember all the innocent people who died as a result of this horrific act of terrorism. I’m glad that all of your friends and family were safe that day, all too many were not. I’m glad that I too did not have any friends or family that were among those that were lost. I too will always remember September 11, 2001 – it is the day that solidified our resolve, and brought us all together. It is the day of OUR history. I didnt know anyone who died either but I know a few people who weren’t as fortunate. It’s a sad day, no doubt. I saw the second plane hit on tv and I was shocked and so terrified. Sometimes I think it was an inside job too. Can’t help it. I saw interviews from ppl who escaped and said they kept hearing explosions everywhere. Makes me wonder, what else is the gov’t hiding from all of us? I have heard the theory but really hope it wasn’t an inside job. That would be a horrible thing to do. I DO believe that the plane that went down in PA was shot down. There’s no way the gov’t would allow a plane to get close to the White House. I, too, did not realize what was happening. I just thought it odd that a small plane wouldn’t be able to fly around a big building. Terrorism did not even cross my mind because at that point in my life terrorism only took place in far away countries. I’m glad your cousin was okay. Thank you for sharing your memories. Very powerful. It’s funny, I attended conferences there before up on the 101st floor (windows of the world) and when they had the blinds open I would stare out the windows and marvel at the planes whizzing by. It never crossed my mind that a plane could actually smash into the building. I too never thought about terrorism. Now, it’s always at the back of my mind. great post. really just brought it all back for me. I know a brother and sister who both worked in the towers. they made it out. as the brother was running he heard is sister calling him running behind him. complete miracle. Wow, that’s an awesome story. So happy to hear that they both made it out safely. I never forget the 9-11 happening and it will always remind me of something bad and scary thing. I really can’t imagine that would happened and to those family that are affected to that bad tragedy. To those family who didn’t get justice. This event shook the whole world. I still well up whenever I read anything about it. Personal and moving, Diane. Thank you for sharing. 11 years later and still remember that day like it was yesterday. So sad. So hard to believe it was 11 years ago. That feeling when I realized it wasn’t an accident is one I will never forget. I never understood how the twin towers could literally fall apart into dust in under 12 seconds. It did not seem physically possible. I didn’t know that a third tower also turned largely to dust during the rest of the day and finally fell apart at 5:21 pm. I didn’t know that WTC 3 and WTC 4 were also mostly turned to dust. Then I read the published forensic analysis of multiple lines of evidence about the events in Manhattan by a doctoral level materials scientist, who had the same questions I did. As a biologist and chemist with a minor in Physics the analysis rang true. One of the most important books of the last 200 years. “Where Did The Towers Go?” by Dr. Judy Wood. Dr. Wood is much maligned and slandered, but her work is accurate.